The Northern Maine Antique Tractor Club presented awards and donated to local causes during its annual banquet, held in November at the Presque Isle Inn and Convention Center. PRESQUE ISLE, Maine — The Northern Maine Antique Tractor Club presented awards and donated to local causes during its annual banquet, held in November at the Presque Isle Inn and Convention Center. President Phil Kilcollins presided, greeting guests and sharing announcements. Each year the club raises funds from several projects, including raffle ticket sales on a restored tractor, the annual Tractor Trek and a yearly auction. Proceeds benefit efforts within Aroostook County, and this year’s monetary donations went to Caring Area Neighbors for Cancer Education and Recovery (C-A-N-C-E-R), Hospice of Aroostook and the Aroostook House of Comfort. The club also supports the education of members’ relatives, and Abigale Currier of Mapleton and Tyler Raymond of Caribou won scholarships. Blacksmith Eugene Katzman earned applause and appreciation for his work during the Northern Maine Fair at the Northern Maine Agricultural Museum. Walter O’Neal was recognized and thanked for his work getting the drag to all of the tractor pulls, and Larry Bull earned recognition as the top raffle ticket seller. The Restorer of the Year medal went to Raymond Walton Ramie. Scott Jordan won the Rock Pile Tractor Award, which means his tractor needs a little TLC. The Sterling Haynes Memorial Award went to Richard and Marolyn Carter for their dedication to the club and their willingness to do any job that needs doing. The Larry Kingsbury Memorial Sportsmanship Award went to Joe Cheney. 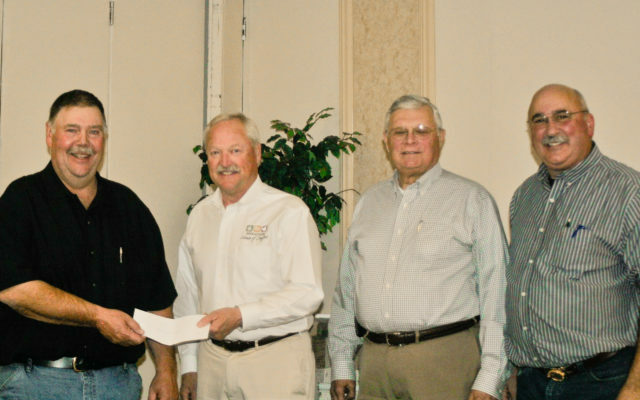 Sponsors for tractor restoration and youth pullers who received safety training this past summer were also recognized. Last summer there were seven tractor pulls. The top pullers in their classes were: Dennis Quint, Tyler Raymond, Roger Quint, Sonny Folsom, Phil Kilcollins, Tami Kilcollins, Janet Wright, Paul Folsom III, Barry Bartley and Chris Langille. Runners-up in their classes were Candice Foster, Meredith Folsom, Paul Folsom III, Wayne Lenentine, Chris Langille, Troy Doody, Perlin Bull, Tyler Raymond, Greg Stiles and Phil Kilcollins. The drawing of the raffle ticket for the restored tractor was a highlight of the evening. Logan Langley, who won last year’s tractor, drew this year’s winner. Chris Labonte of Eagle Lake received the Farmall 230. In second place, Wilmer Beaulieu of Madawaska won the Farmall pedal tractor, and in third place, Cole Dufour of Fort Fairfield won the electric chute controller for a snowblower.